Gina Franco is the author of The Keepsake Storm, poems that explore memory and narrative, especially in light of place, faith, and identity. She has published widely in many journals, including 32 Poems, Black Warrior Review, BorderSenses, Copper Nickel, Crazyhorse, Diagram, Drunken Boat, Image, Fence, The Georgia Review, Poetry, Prairie Schooner, Seneca Review, Tuesday; an Art Project, West Branch Wired, Zocalo, and Zone 3. Her writing is also anthologized in A Best of Fence: the First Nine Years, Lasting: Poems on Aging, Loft and Range, The Wind Shifts: New Latino Poetry, Camino del Sol: Fifteen Years of Latina and Latino Writing, and The Other Latin@: Writing Against a Singular Identity. 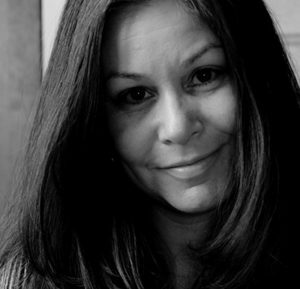 She earned degrees from Smith College and Cornell University, and she was awarded residencies and fellowships with Casa Libre en la Solana, the Santa Fe Writers’ Conference, the Bread Loaf Writers’ Conference, and the PINTURA:PALABRA Residency in Washington, DC, sponsored by Letras Latinas: Institute for Latino Studies at the University of Notre Dame. She served as art editor, gratefully, for several years to Pilgrimage Magazine. She teaches poetry writing, 18th & 19th century British literature, Gothic literature, Modern & contemporary poetry, poetry translation, Latino writing, religion and literature, and literary theory at Knox College, where she was awarded the Philip Green Wright-Lombard Prize for distinguished teaching. She is an oblate with the Catholic monastic order of the Community of St John in Princeville, Illinois. If there is any tension between spiritual and artistic life, it is upheld by the need to keep religion and art distinct. Some of western Christianity’s most celebrated writers--Simone Weil, Thomas Merton, and Gerard Manley Hopkins, for example--wrestled with the competing claims of these two realms. A classic example of this tension is the mystical experience has been linked to silent contemplation and humility while artistic writing is often associated with egotism, self-absorption, and a desire for power. This workshop will emphasize the way in which spiritual writing can become a form of contemplation, meditation, and prayer. We will explore the ancient monastic emphasis on reading, contemplation, community, and work to transform the modern poetry workshop into an experience that leads to a more profound spiritual engagement with writing poetry. Apply for a scholarship to Gina Franco’s class here.